Chinese Foreign Minister Wang Yi has told his North Korean counterpart Ri Yong Ho that he hopes an envisioned summit between the North's leader Kim Jong Un and U.S. President Donald Trump will succeed, the government said Wednesday. During their talks in Pyongyang, Wang was quoted by the Chinese Foreign Ministry as saying Beijing hopes that the U.S.-North Korea summit will go smoothly and make substantial progress. Wang is making a two-day trip to North Korea through Thursday following last week's inter-Korean summit. In Pyongyang, he might also meet with Kim, who is likely to hold talks with Trump as early as by the end of May, the first-ever summit between the two counties. Ri is believed to have tried to obtain support from China before expected tough negotiations with Trump, as the United States has urged North Korea to give up all its nuclear weapons. North Korea, meanwhile, may call on Trump to protect the continuation of its hereditary regime in return for pledging to achieve denuclearization on the divided peninsula. At Friday's summit, Kim and South Korean President Moon Jae In agreed to pursue "complete denuclearization" on the Korean Peninsula and strive to formally end the 1950-1953 Korean War. 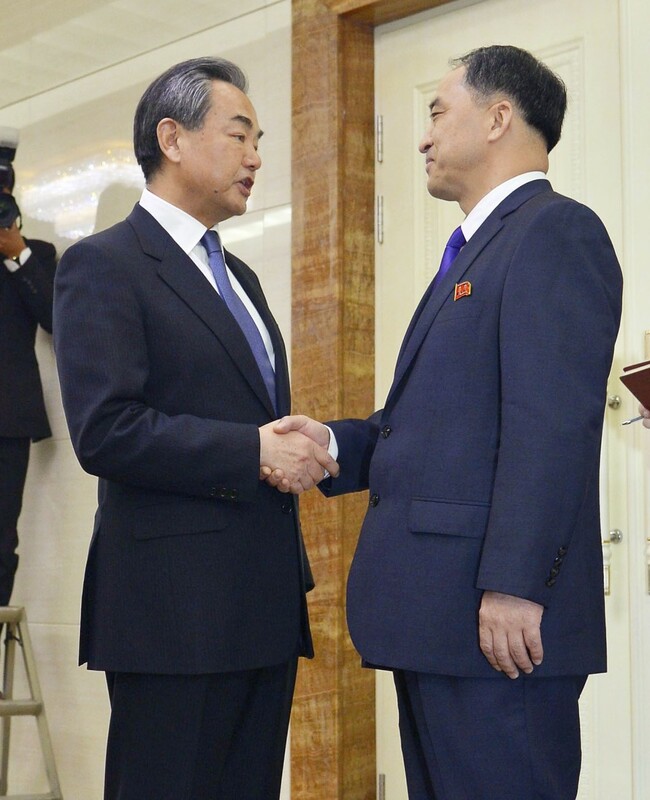 Kim and Moon also made an agreement that their governments will "actively pursue" trilateral meetings involving the two Koreas and the United States, or quadrilateral meetings also involving China. In the war, United Nations forces led by the United States fought alongside South Korea against the North, which was supported by China and the Soviet Union. Hostilities ceased with an armistice agreement signed on July 27, 1953 by the U.S.-led U.N. Command, North Korea and China. "China will play a role in establishing peace on the Korean Peninsula," Foreign Ministry spokeswoman Hua Chunying said at a press conference in Beijing, indicating China's readiness to work to replace the Korean War armistice with a peace treaty. China, known as North Korea's main economic lifeline, has welcomed Kim's recent commitment to denuclearization, as it has argued that Pyongyang's nuclear crisis should be resolved in a peaceful manner through dialogue. Relations between China and North Korea have improved markedly since Kim visited Beijing in March, making his first foreign trip since becoming North Korea's supreme leader following the death of his father, Kim Jong Il, in December 2011. Since late last year, bilateral ties had worsened as China had been increasing economic sanctions against North Korea over Kim's continued pursuit of ballistic missiles and nuclear weapons in defiance of international warnings. Wang is visiting North Korea at the request of Ri. Following Chinese President Xi Jinping's acceptance at their March summit of an invitation from Kim to visit Pyongyang, Wang may start to arrange Xi's trip with Ri. The two foreign ministers also held talks in early April in Beijing.